$20 proceeds benefit the Pomerene Center for the Arts. Announcing another annual Ed Has Class, Anne Has Funk flower arranging evening–this year we’re playing around with Ikebana. A cautionary word–expect a funkified (i.e. 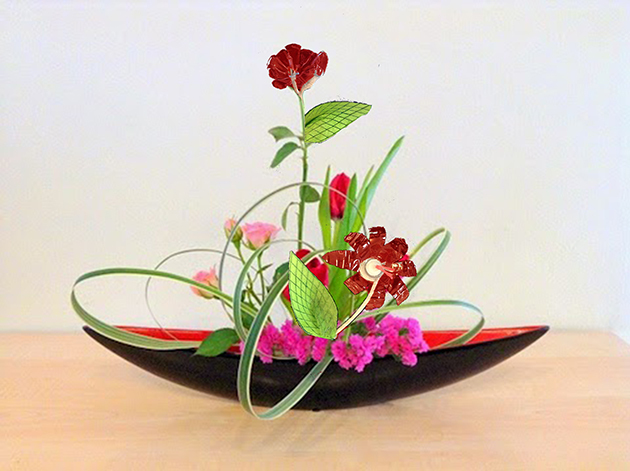 recycled materials in addition to natural material) Ikebana experience. Ed Kiefer is supplying the containers, flowers and natural materials. Anne Cornell is gathering an assortment of found objects. Together they will design a valentine centerpiece “on stage.” For the second part of the evening, the materials will be turned over to the audience. Everyone will leave with their own ikebana centerpiece. It’s our hope to exhibit the finished arrangements at the Chocolate Extravaganza February 14th for the whole community to see. p.s. Bring your own beverage and any found objects you might want to use as embellishment. In addition to having a full compliment of supplies on hand, we’ll provide cups and napkins .